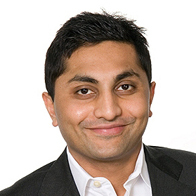 When Ameya Pawar was an student at SSA, concentrating in Social Administration, he ran a "Pawar for the People" campaign for alderman of Chicago's 47th Ward. His goal was to run an independent campaign, to "stay positive" and to build a platform around public policy. After becoming an alderman, he found time to fit in school, an internship, work, and life. Pawar, S.M. '09 (Graham), launched his campaign with his field director, fellow student Jim Poole (now AM '11), soon after they started at SSA in October of 2009. Together, they worked every weekend and knocked on thousands of doors. In February 2011, Pawar won with a 1,000 vote margin over 35-year incumbent Eugene Schulter's hand-picked would-be successor, Tom O'Donnell. "We ran this on a shoestring budget," Poole says. "So we worked hard pounding the pavement and meeting ward voters. The size of one's campaign chest should not decide public policy." Pawar said his number one priority as alderman would be to address Chicago's budget deficit, with education, affordable housing, reducing crime, and TIF reform rounding out his ambitious goals. He said he's also adamant about breaking the "culture of clout" in the city, intending to build transparency, including establishing a ward assembly: a replica city council on the ward level. "Transparency is not just about posting things to a website," Pawar says. "It's about putting information together in a digestible way to create community-level discussion that causes systemic change." Pawar says that one of the reasons he applied to SSA's master's program was his admiration of the work of former SSA Associate Professor Scott Allard, including his book, Out of Reach: Place, Poverty and the New American Welfare State. Allard, remembering Pawar's time in his class, is confident in his abilities. "In class he demonstrated the ability to hear many different sides to an issue, respect different opinions and take alternative perspectives into account when formulating his own views—traits I expect will be useful on the City Council," he says. Pawar says he decided to run for office because of a combination of his work at Northwestern University's Office of Emergency Management and the experience of his first year SSA field placement with Heartland Alliance. There, he worked to resettle refugees from around the world with Charna Epstein, A.M. '05, S.M. '09 (Graham), who was also in Ameya's cohort in the Threat and Response Management program. Pawar, Epstein, and Scott Simon, S.M. '09 (Graham), co-wrote a book, Emergency Management and Social Intelligence: A Comprehensive All-Hazards Approach. The authors say that "there was an absence of a human side to emergency response and the book gives ideas to formulate better responses." Pawar also developed an iPhone application, Chicago Works, in conjunction with his campaign that allows a user to make service requests to Chicago's 311 service and track issues as they are addressed. When asked about which SSA classes helped prepare him for his career and public office, Pawar says that [then] Dean Neil Guterman's clinical core class was one of the most valuable. "Dean Guterman taught us how to talk with people, how to rephrase questions and adapt my message to a diverse range of people," Pawar says. "This became a very useful skill during my campaign." "When Ameya announced he was running for alderman in our class—with Jim by his side as his campaign manager—I think his classmates were a bit wide-eyed and at the same time immediately supportive of both," Guterman says. "It's this kind of imagination that we like to see and nurture in our students, and now Ameya will have the opportunity to serve his ward and the city with skills and knowledge he's gained from his studies at SSA." Pawar and Poole say that they hope to create SSA field placements in the alderman's office and hire second-year students to learn and work on policy and advocacy issues. "Working on this campaign with the residents of the 47th Ward has been one of the greatest learning experiences of my life," Poole says. "There's no better way to serve this city than by giving that same opportunity to future students at SSA so they can inform their own practice."